I have around ~1200 photos shot from an event. I was shooting to raw only. My ISO was quite high, 3200, but since my camera handles high isos perfectly (Canon 60D), all I need is to boost up the noise reduction just a bit, to about 20 out of 100. The default is 0. So basically, when I drop any photo from the event into photoshop, click on "auto" (to have the exposure automatically adjusted), then set white balance to "auto", then set noise reduction to 20, this is all I need to process the photo. Then I just click OK and save it as JPG. The question is: how do I make Photoshop loop through all the 1200 raws and batch process them like this and save it to a JPG file? 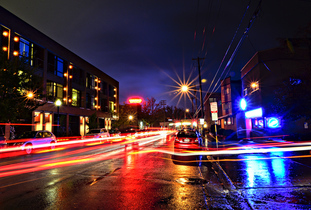 Alternatively, I can use lightroom (or whatever CS5 masters collection app thereof) if that eases the process up. This is certainly something easily done in lightroom. If you import all 1200 photographs you can select all and then apply whatever development processes you want before exporting as jpg. My preferred route though would be to create a development preset and set that as the default before importing and then to create a filesystem publishing entry with whatever jpeg setting I want - then simply import photos, drag to the publication folder and then select it and "publish". The advantage of this is that if you change the settings on individual photos later it will only need to republish those that have changed. I don't think Camera Raw has batch processing facilities. However, you can download a free Raw processor like RawTherapee which does everything ACR does, and has batch processing. 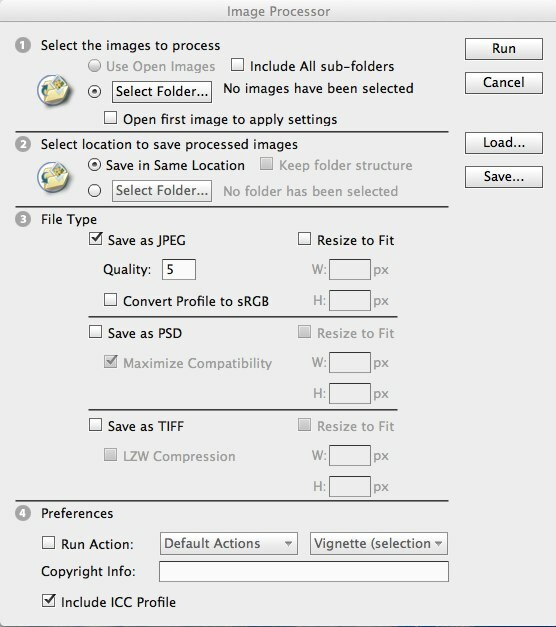 In Photoshop, you want to choose File> Automate> Scripts> Image Processor. From here simply choose the folder with the images, then select Save As> JPEG. However, the dialog does not accommodate your other settings, for this you will need to create a Photoshop Action, and select that to run against the images in the "Preferences" section of the dialog box. HOWEVER: IMHO, this is FAR easier in Lightroom, which was designed for this activity, as it is a WORKFLOW tool on top of Camera RAW. Like Image Processor, you will need to create a develop preset in LR and apply it at Import time, but creating a preset in LR is easier than an action in PS5, and LR can be set to even watch a folder and take this action every time an image drops into the folder. Not the answer you're looking for? Browse other questions tagged lightroom photoshop raw batch adobe-camera-raw or ask your own question. Which software can batch-process RAW photos on Linux? Can I open and edit a specific layer in Camera Raw? What camera settings may affect a RAW photo? Why isn't my Luminance edit saved in Camera Raw?